Two Palestinian civilians, including a child, were killed. Israeli warplanes launched 91 missiles on the Gaza Strip. 2 Palestinian children were killed and 27 others, including 2 children were wounded. Many civilian facilities sustained material damage. 10 Palestinian civilians, including 4 children and a journalist, were wounded in the West Bank. 2 Palestinian civilians were wounded. 2 residential houses sustained partial damage. Israeli forces conducted 77 incursions into Palestinian communities in the West Bank and a limited incursion was conducted in the southern Gaza Strip. 66 civilians, including a child and a woman, were arrested in the West Bank. 2 residential houses and an agricultural barrack were demolished in Shu’fat and al-Tour villages. A civilian was forced to self-demolish his house in al-Thawri neighbourhood. Israeli forces banned holding an academic conference in Hind al-Husaini College and confiscated the contents of an elementary school in Shu’fat. 3 roofs and an agricultural room were demolished in Duma village, southeast of Nablus. Israeli settlers levelled 82 dunums, burned 180 olive trees and smashed 6 vehicles’ windows. 6 shooting incidents were reported against the Palestinian fishing boats in the Gaza Sea, but no casualties were reported. A civilian was arrested at Beit Hanoun (Erez) Crossing. At approximately 01:30, Israeli forces moved into Sebastia village, northwest of Nablus. They raided and searched a house belonging to Mohammed Yahiya Yusuf Darwish (22) and then arrested him. Around the same time, Israeli forces moved into Qifin village, north of Tulkarm. They raided and searched a house belonging to Fares Yusuf Fares Khasib (36) and then arrested him. At approximately 02:30, Israeli forces moved into Tulkarm. They raided and searched a house belonging to Rami As’ad Ahmed Shalbayah (35) and then arrested him. Around the same time, Israeli forces moved into Qarawet Bani Hassan village, west of Salfit. They raided and searched several houses after which they arrested Mustafa Ya’qoub ‘Asi (18), Bahjat Rafe’a Mar’ie (18) and Lutfi Hatem Rayan (17). At approximately 03:30, Israeli forces moved into Deir Abu Mash’al village, northwest of Ramallah. They raided and searched a house belonging to Mohammed Fayez Dar ‘Ata (22)and then arrested him. 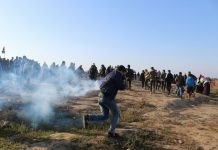 At approximately 19:00, Israeli soldiers stationed behind the border fence between the Gaza Strip and Israel, east of Deir al-Balah in the central Gaza Strip, opened fire at agricultural lands. As a result, the farmers were forced to leave fearing for their lives, bur no casualties were reported. Note: During the aforementioned day, Israeli forces conducted (7) incursions in the following areas and no arrests were reported: Shuweikah village, east of Tulkarm; Kufor Sour and al-Ras villages, south of the city; Sa’ir, Kharas villages and al-‘Aroub refugee camp in Hebron; and Beit Iba village, west of Nablus. At approximately 02:00, Israeli forces moved into Qalqas village, southeast of Hebron. They raided and searched a house belonging to Yusuf Sbaih Abu Suneinah (24) and then arrested him. At approximately 18:25, Israeli forces moved into ‘Azzoun village, east of Qalqiliyah. They raided and searched a house belonging to Mohammed Mazen Mahmoud Samarah (21) and then arrested him. Note: During the aforementioned day, Israeli forces conducted (10) incursions in the following areas and no arrests were reported: Tulkarm refugee camp, Qifin, Beit Led and Zeta villages in Tulkarm; Yasouf village, east of Salfit; Beit Ummer, al-Surrah, Emrish villages in Hebron; and ‘Awerta village, southeast of Nablus. At approximately 01:20, an Israeli drone fired a missile at al-Lewa’a site belonging to al-Qassam Brigades (the Military Armed Wing of Hamas Movement), east of al-Shaikh Zayed Housing Project in Beit Lahia in the northern Gaza Strip. After less than 5 minutes, Israeli warplanes fired a missile at the same site. The airstrike caused severe damage to the site from the northern side, but no casualties were reported. The sounds of bombing caused fear among civilians in the northern Gaza Strip, particularly children and women in addition to patients of the Indonesian Hospital, which is located in the northern side of the site. Around the same time, the Israeli warplanes launched 5 missiles; two of them were from drones, at a site belonging to Palestinian armed groups, east of al-Buraij. As a result, the site sustained material damage, but no casualties were reported. At approximately 01:40, Israeli warplanes launched 4 missiles; two of them were from drones, at a site belonging to Palestinian armed groups, west of al-Buraij. As a result, the site sustained material damage, but no casualties were reported. At approximately 02:00, Israeli warplanes launched 10 missiles, with few minutes between each of the missiles, at an agricultural land in al-Shawkah village, northeast of Rafah in the southern Gaza Strip, but no casualties were reported. At approximately 04:20, Israeli warplanes launched 8 missiles at al-Basha empty land in al-Burah area, northeast of Beit Hanoun in the northern Gaza Strip. The airstrikes caused deep holes in the area, but no casualties were reported. The sounds of caused fear among civilians in the northern Gaza Strip, particularly children and women. At approximately 12:45, Israeli warplanes launched 4 missiles; two of them were from drones, at a site belonging to Palestinian armed groups, adjacent to Salah Eden road, south of Gaza City. The airstrike caused material damage to the site, but no casualties were reported. At approximately 12:50, Israeli warplanes launched 3 missiles, with 3 minutes between each of the missiles, at a site belonging to al-Qassam Brigades (the Military Armed Wing of Hamas Movement) along the Egyptian-Palestinian border, south of Rafah. The airstrike caused a large damage to the site and fear among a large number of civilians in a popular market that is near the targeted site, but no casualties were reported. At approximately 01:00, a Funeral procession of Rami Wahid Sabarnah (37) was in Beit Ummer village Mosque. Rami was killed by the Israeli soldiers in Jaber neighborhood in the Old City in Hebron on 02 June 2018. The Israeli forces claimed that Rami attempted to carry out a run-over attack as he was driving a bulldozer during his work in the Sanitation Project of Hebron’s Municipality. Rami’s dead body was detained until Friday on 13 July 2018. The Israeli forces then handed the dead body to PRCS. When the funeral procession arrived at the village entrance where the Islamic Cemetery was, an Israeli force cut the mourners’ road and forced them to walk through a side road to reach the cemetery. Meanwhile, angry young men threw stones at Israeli soldiers. The soldiers fired sound bombs and tear gas canisters at them. After that, a wastewater pumping vehicle arrived at the area and stationed in ‘Asidah area and flooded commercial shops and residential houses by a wastewater. The young men closed the road with tires and threw stones and empty bottles at Israeli forces. The soldiers topped the shops’ roofs and fired live bullets at the stone-throwers. As a result, a 16-year-old civilian was hit with a live bullet to the foot and a 17-year-old civilian was hit with a live bullet to the foot. The wounded civilians were transferred via a PRCS ambulance to the Governmental Hospital in Hebron to receive medical treatment. At approximately 13:05, Israeli warplanes launched 8 missiles at the eastern site belonging to al-Qassam Brigades (the Military Armed Wing of Hamas Movment). The site is located near Bisan Entertainment City in Beit Lahia in the northern Gaza Strip. At approximately 13:15, the Israeli warplanes launched 3 other missiles at the same site and at approximately 01:50, it launched 7 missiles at the same site. As a result, the site sustained severe material damage, but no casualties were reported. At approximately 13:30, Israeli warplanes launched 4 missiles at Qureish site belonging to Palestinian armed groups, but no casualties were reported. The site is located in the south of Gaza City. At approximately 13:40, Israeli warplanes launched a missile at Abu Jarad military site belonging to Palestinian armed groups, but no casualties were reported. The site is located near al-Shuhada’a intersection, south of Gaza City. At approximately 14:20, an Israeli warplane launched a missile at a group of civilians, who were in the east of al-Tuffah neighborhood, east of Gaza City. The airstrike caused the injury of Ahmed Akram Hasan Suweidan (29). He was transferred to al-Shifa Hospital and doctors classified his injury as minor. At approximately 14:35, an Israeli warplane launched a missile at an empty land in the east of Tal al-Za’tar in Jabalia in the northern Gaza Strip, but no casualties were reported. The explosion caused fear among civilians, whose houses are near the targeted area, particularly women and children. At approximately 14:40, an Israeli warplane fired a missile at Hittin military site belonging to al-Quds Brigades (the Military Armed Wing of the Islamic Jihad Movement), north of Beit Lahia in the northern Gaza Strip. The airstrike caused partial material damage to the site, but no casualties were reported. At approximately 15:00, Israeli warplanes launched 5 missiles at an agricultural land, east of Deir al-Balah in the center of the Gaza Strip. The airstrike caused partial material damage to the site, but no casualties were reported. At approximately 15:35, Israeli tanks stationed behind the border fence between the Gaza Strip and Israel, east of Khan Younis in the southern Gaza Strip, fired 3 artillery shells, 2 of them targeted a border control point belonging to Palestinian armed groups, east of al-Qararah village. The shelling caused material damage to the site, but no casualties were reported. The third shell fell on a house belonging to ‘Ali Abdul Karim Salamah al-Zer (59), near al-Ma’ari School in al-Qararah. As a result, the 100-square-meter house, which is a ground floor covered with tin plates and concrete and inhabited with 5 individuals, was partially damaged. Moreover, ‘Ali was hit with fracture to the right leg and his wife ‘Etaf Khalid Adeeb al-Zer (45) sustained bruises to the right leg while they were setting outside the house. The wounded civilians were transferred to Nasser Hospital and doctors classified their injury as moderate. At 14:40, an Israel warplane launched 2 missiles at an empty land in the north of al-‘Atatrah Clinic in al-‘Atatrah neighborhood in Beit Lahia in the northern Gaza Strip, but no casualties were reported. At approximately 16:45, Israeli drones fired 2 missiles at the vicinity of a group of young men, who attempted to fire incendiary balloons at the border area between the Gaza Strip and Israel, east of al-Fukhari area, southeast of Khan Younis in the southern Gaza Strip, but no casualties were reported. In new car crime, Israeli forces killed 2 Palestinian civilians and wounded 23 others, including 2 children in a series of airstrikes targeting an uninhabited al-Katiba building, which is located next to a public park in a densely populated area and government and civil institutions in the center of Gaza City. PCHR indicates that these airstrikes came in light official Israeli threats as the Israeli forces’ spokesperson Avichai Adrei stated that the Israeli army will conduct more raids in the Gaza Strip as long as it is needed. He also displayed photos of the 2014 Israeli Offensive on the Gaza Strip, pointing out for the possibility of repeating their scenario. The Israeli forces’ spokesperson send a message through his page early today to the Gaza Strip population to “stay away from any building, infrastructure that serves the terrorist parties, any person known as terrorist and every area where terrorist organizations operate. Save your lives and you were warned.” This indicates an Israeli intention to escalate the situation, although the majority of the victims who fall as a result of this offensive are Palestinian civilians. According to PCHR’s investigations, at approximately 18:00, Israeli warplane fired 9 missiles at a 5-storey uninhabited building in al-Katiba area in the center of Gaza City. The abovementioned building is located next to a public park in a densely populated area especially with children and Sheikh Zayed Mosque in addition to Government institutions such as Ministry of Endowments (Awqaf), Palestine General Personnel Council and al-Katibah Central Prison. The bombing resulted in the killing of Lo’ai Mazen Nabil Kuhail (14) and his friend Ameer Mohamed Waleed al-Namirah (14). Both of them are formal-Sabrah neighborhood in Gaza City. Moreover, 23 civilians, including 2 children, were wounded due to the scattering of shrapnel and rubble. The bombing also caused material damage to nearby buildings such as breaking windows, cracking the buildings’ walls, destruction in the Arts and Crafts Village and great damage to the ambulance building belonging to the Ministry of Health and the lecture halls at al-Azhar University. It should be noted that the abovementioned building was earlier exposed to shelling several times by the Israeli forces. At approximately 18:30, Israeli forces fired an artillery shell at an empty land, which is located in the vicinity of al-Shuhada’a Islamic Cemetery, east of Jabalia in the northern Gaza Strip, but no casualties were reported. At approximately 19:15, an Israeli drone fired a missile at an empty land in the east of al-Furousiyah Club, south of Beit Lahia in the northern Gaza Strip. The sound of explosion caused fear among civilians, whose houses near the targeted area, particularly women and children, but no casualties were reported. Note: During the aforementioned day, Israeli forces conducted (9) incursions in the following areas and no arrests were reported: Sebastia village, northwest of Nablus; Dura and Halhoul in Hebron; Shuweikah Suburb, ‘Anabta, Kufor al-Labad, Beit Led, Ramin and Safarin villages in Tulkarm. At approximately 01:00, Israeli forces moved into Jawhar Mount area in the southern side of Hebron. They raided and searched a house belonging to Eyad Mohammed Badran Jaber (37) and then arrested him. At approximately 01:30, Israeli forces fired 2 shells at the east of al-Tuffah neighborhood, east of Gaza City. One of the 2 missiles targeted the eastern wall of a 4-story house belonging to Majed Mohammed Saleh Sukkar (55). As a result, Mohammed Majed Mohammed Sukkar (18) was hit with shrapnel to the face, and Medhat Mukhles Khalaf Basal (26) was hit with shrapnel throughout his body while they were near the house. The house also sustained severe damage. At approximately 02:00, members of Israeli undercover units “Mista’arvim” dressed like Palestinian civilians arrested Malek Mohammed Ahmed al-Rajbi (29) from his work at a petrol station in Ras al-Jourah area in the northern area in Hebron. After they left the station, an Israeli force arrived at the area and confiscated the recording tape of the surveillance cameras. At approximately 09:00, Israeli forces accompanied with 2 military vehicles moved into al-Jalazoun refugee camp, north of Ramallah, and then patrolled the streets. Dozens of Palestinian young men gathered and threw stones and empty bottles at Israeli soldiers. The soldiers fired live and rubber bullets and tear gas canisters at them. as a result, 4 civilians were hit with Two-Two bullets to the lower limbs. They were transferred Palestine Medical Complex to receive medical treatment and doctors classified their injury as moderate. Eyewitnesses said to PCHR’s fieldworker that the Israeli soldiers fired sound bombs and tear gas canisters between houses after raiding and searching them. During that the Israeli forces arrested 7 civilians and took them to an unknown destination. At approximately 12:35, an Israeli drone fired a missile at 2 members of Palestinian armed groups while they were driving a motorbike near the Customs’ Checkpoint, which is located in the south of Beit Hanoun “Erez” crossing in the northern Gaza Strip. As a result, they sustained shrapnel throughout their bodies. The wounded civilians were transferred to the Indonesian Hospital in Jabalia and doctors classified their injury as moderate. At approximately 12:40, Israeli forces stationed behind sand barriers, east of Abu Safiyah Hill, northeast of Jabalia in the northern Gaza Strip, opened fire at a group of civilians, who approached the border area, forcing them return, but no casualties were reported. At approximately 13:00, Israeli warplanes launched 3 missiles at a group of Palestinian young men, who fired incendiary balloons, east of Deir al-Balah in the center of the Gaza Strip, but no casualties were reported. At approximately 15:00, Israeli warplanes launched a missile at a group of Palestinian young men, who fired incendiary balloons, east of al-Maghazi in the center of the Gaza Strip, but no casualties were reported. At approximately 16:00, Israeli gunboats stationed offshore opened fire at Palestinian fishing boats sailing within 3 nautical miles off Deir al-Balah shore in the center of Gaza Strip. The shooting recurred at approximately 23:15 on the same day. As a result, the fishermen were forced to flee fearing for their lives, but no casualties were reported. At approximately 17:15, an Israeli warplane fired a missile at a group of civilians, who were walking on al-Masriyin Street, east of Beit Hanoun in the northern Gaza Strip. As a result, 2 civilians were wounded. They were transferred to the Indonesian Hospital in Jabalia and doctors classified their injury as minor. 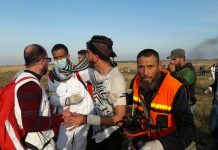 The Israeli forces announced later that the Israeli warplanes targeted a group of civilians who flew incendiary kites in the northern Gaza Strip. At approximately 21:05, Israeli gunboats stationed off al-Sudaniyah shore, west of Jabalia in the northern Gaza Strip, heavily opened fire at Palestinian fishing boats sailing within 3 nautical miles and chased them. As a result, the fishermen were forced to flee fearing for their lives, but neither casualties nor material damage was reported. Note: During the aforementioned day, Israeli forces conducted (4) incursions in the following areas and no arrests were reported: al-Majd, Deir Samet, Tarqumiya and al-Shuyoukh villages in Hebron. At approximately 01:00, Israeli forces moved into al-Khader village, south of Bethlehem. They raided and searched a house belonging to Khalid Fawaz Salah (27) and then arrested him. It should be noted that Salah was preparing for his wedding on next Thursday. Around the same time, Israeli forces moved into Salfit. They raided and searched a house belonging to Mohammed ‘Amar Abu Zaher (20) and then arrested him. At approximately 02:30, Israeli forces moved into Jenin refugee camp, west of Jenin. They raided and searched a house belonging to Nayef Ziyad Nayef Turkman (22) and then arrested him. At approximately 03:00, Israeli forces moved into Faqou’ah village, northeast of Jenin. They raided and searched a number of houses and then arrested Jawad Rasem Ahmed al-Khatib (24) and Husam Ghaleb al-Khatib (24). At approximately 03:30, Israeli forces moved into al-Duheishah refugee camp, south of Bethlehem and stationed near Al-Phoenix Association near the Palestinian security services gathering in the camp. They raided and searched a number of houses, including a house belonging to Khalil Mohammed al-Haj (22) and then arrested him. At approximately 14:10, an Israeli warplane fired a missile at a group of civilians who were walking on Zemmo Street, southeast of Beit Hanoun in the northern Gaza Strip. However, neither casualties nor material damage was reported. At approximately 15:40, Israeli forces stationed at military watchtowers behind the border fence with Israel, east of al-Amal neighborhood, northeast of Beit Hanoun in the northern Gaza Strip, heavily opened fire at lands adjacent to the border fence. The shooting was concentrated at 2 border control points, which are around 800 meters into the west of the border fence belonging to Palestinian armed groups, but no casualties were reported. The shooting caused fear among farmers who were in their lands and civilians, whose houses are near the border area. At approximately 04:00, an Israeli drone fired a missile at a border control point, which is about 1 kilometer into the west of the border fence with Israel, east of Beit Hanoun in the northern Gaza Strip, but no casualties were reported. At approximately 04:05, Israeli forces stationed behind the border fence between the Gaza Strip and Israel fired an artillery shell at an empty land, which is around 300 meters into the west of the border fence, east of al-Shuhada’a Islamic Cemetery, east of Jabalia in the northern Gaza Strip, but no casualties were reported. At approximately 21:00, Israeli gunboats stationed offshore, west of Khan Younis in the southern Gaza Strip, heavily opened fire at Palestinian fishing boats sailing within the allowed fishing area. And chased them. They also fired flare bombs. As a result, the fishermen were forced to flee fearing for their lives, but neither casualties nor material damage was reported. At approximately 21:40, Israeli gunboats stationed offshore opened fire at Palestinian fishing boats when the fishermen attempted to sail more than 3 nautical miles off Deir al-Balah shore in the central Gaza Strip. As a result, the fishermen were forced to flee fearing for their lives, but neither casualties nor material damage was reported. At approximately 22:00, Israeli forces moved into Deir al-‘Asal al-Fuqa village, west of Dura, southwest of Hebron. They raided and searched a house belonging to Suleiman Mohammed al-Shawamrah (50) and then arrested his wife Feryal al-Darawish (41). Note: During the aforementioned day, Israeli forces conducted (5) incursions in the following areas and no arrests were reported: Sebastia village, northwest of Nablus; Qalqiliyah and Kufor al-Deek village, west of Salfit, Ethna village and al-Fawar refugee camp in Hebron. At approximately 02:00, Israeli forces moved into Nablus. They raided and searched a house belonging to Taha Thseen al-Titi (22) and then arrested him. Around the same time, large Israeli forces moved into Bethlehem and stationed on al-Jabal Street, in the vicinity of the Psychiatric Hospital and Jamal Abdul Nasser Street. They raided and searched dozens of houses after which they arrested Remon Busharah Zabalah (56), Rami Salim al-Rafati (43) and Maohmmed Khalid al-Sheikh (24). At approximately 02:30, Israeli forces moved into Beta village, southeast of Nablus. They raided and searched a number of houses and then arrested Lo’ai Taiseer Abdul Fattah Bani Shamsah (24) and Abdullah Bashar Walid Kharyoush (23). Around the same time, Israeli forces moved into Nablus. They raided and searched a house belonging to ahmed ‘Amer Nassar (25) and then arrested him. At approximately 04:30, Israeli forces moved into al-Khader village, south of Bethlehem. They raided and searched a number of houses amidst firing rubber bullets and tear gas canisters. They then arrested Wajdi Zuhair Mousa (20) Ahmed ‘Ouda ‘Essa (21), Mos’ab Mofeed Soboh (19), Akram Nader Sobuh (19) and Mohammed Medhat ‘Essa (20). At approximately 03:40, Israeli forces accompanied with 2 military vehicles moved into Silwad village, northeast of Ramallah. They raided and searched a number of houses belonging to Mohyee Yaheyah Hammad (24), Mohammed (18) and Jihad Zaher Hammad (20). At approximately 07:30, Israeli forces accompanied with a number of military vehicles moved about 100 meters into the east of al-Qararah village, east of Khan Younis in the southern Gaza Strip. They leveled the lands and repaired the barbed wire for hours and then redeployed along the border fence between the Gaza Strip and Israel. At approximately 15:00, an Israeli warplane launched a missile at a group of civilians while they were in the southeast of the Eastern Cemetery, northeast of al-Tuffah neighborhood, east of Gaza City. As a result, a 29-year-old civilian sustained shrapnel to the face. He was transferred to the Indonesian Hospital. Doctors classified his injury as minor. At approximately 20:00, Israeli gunboats stationed off former al-Waha shore, northwest of Beit Lahia in the northern Gaza Strip, heavily opened fire at Palestinian fishing boats sailing within 2 nautical miles and chased them. The shooting sporadically continued until approximately 21:00 on the same day. As a result, the fishermen were forced to flee fearing for their lives, but neither casualties nor material damage was reported. Note: During the aforementioned day, Israeli forces conducted (4) incursions in the following areas and no arrests were reported: Qalqiliyah and al-Zawiyah village, northwest of Salfit; Tarqumiya village, Dura and Halhoul. At approximately 01:00, Israeli forces moved into al-Zawiyah village, northwest of Salfit. They raided and searched a house belonging to Maher Rabah abdul Fattah Shuqair (23) and then arrested him. At approximately 02:00, Israeli forces moved into Jenin and its camp, west of the city. They raided and searched a number of houses after which they arrested 6 civilians, including a father and 3 sons, namely Ahmed Tayeb Jaradat (56), his sons Tamer (24), Saber (22), and Ra’ouf (20); Ahmed Sa’ed Marzouq (22), Wesam Abu Zaid (25). While the Israeli forces surrounded Jaradat’s house, a number of children gathered and threw stones and empty bottles at Israeli soldiers, who opened fire at them. As a result, 2 children were hit with live bullets to the lower limbs. Around the same time, Israeli forces moved into Beit Rema village, northwest of Ramallah. They raided and searched several houses and then arrested Maxim Husni al-Barghuthi (22) and Omer Mohammed al-Barghuthi (19). Around the same time, Israeli forces moved into Deir Netham village, east of Nablus northwest of Ramallah. They raided and searched a house belonging Ibrahim Faraj al-Tamimi (18) and then arrested him. Around the same time, Israeli forces moved into several neighborhoods in Yatta, south of Hebron. They raided and searched a number of houses and then arrested 5 civilians namely Rami ‘Ali al-Najjar (21); Mohammed (21), his brother Ahmed Jebril Makhamrah (23), Mohammed Shehadah Makhamrah (25) and ‘Oudai Jihad al-‘Amour (26). At approximately 02:45, Israeli forces moved into Qabatiyah village, southeast of Jenin. They raided and searched a number of houses and then arrested 3 civilians namely Hasan Yusuf Dahmaz (30), ‘Essam Yusuf Saba’nah (27) and ‘Awni ‘Adnan Kamil (37). Around the same time, Israeli forces moved into Marakah village, south of Jenin. They raided and searched a house belonging to Abdul Hakim Saleh Khalil (44) and then arrested him. At approximately 03:00, Israeli forces moved into Thanabah village, east of Tulkarm. They raided and searched a house belonging to Mousa Jamal Mousa Serouji (21) and then arrested him. At approximately 03:30, Israeli forces moved into al-Tirah neighborhood, west of Ramallah. They raided and searched a house belonging to Haitham Salem Siyaj and then handed him a summons to refer to the Israeli Intelligence Service in “Ofer” military camp, southwest of Betunia village, west of the city. At approximately 04:00, Israeli forces moved into Betunia village, west of Ramallah. They raided and searched 2 houses belonging to Sami Abu Husein (49) and Sa’ed Abu al-Baha (35) and then arrested them. It should be noted that the abovementioned civilians were former prisoners at the Israeli jails. Around the same time, Israeli forces moved into al-Moghir village, northeast of Ramallah. They raided and searched 2 houses belonging to Ayoub Rasmi Abu ‘Alia (20) and Montaser Mesbah Abu ‘Alia’a (31) and then arrested them. Note: During the aforementioned day, Israeli forces conducted (3) incursions in the following areas and no arrests were reported: Deir Samet and Bani Na’im villages in Hebron; and Howarah village, south of Nablus. On Thursday, 12 July 2018, Israeli authorities allowed 3 persons; and on Monday, 16 July 2018, one person to return to the West Bank. On Monday, 16 July 2018, Israeli authorities allowed 66 persons to participate in an entertainment trip. At approximately 15:00 on Tuesday, 17 July 2018, Israeli forces stationed at Beit Hanoun (Erez) Crossing, north of the Gaza Strip, arrested Mahmoud ‘Awaad Mohamed al-Sha’ir (50), from Kherbit al-‘Adas neighborhood in Rafah, south of the Gaza Strip. Mahmoud was arrested while heading to the West Bank in order to follow-up his business in exporting vegetables. Mahmoud’s brother, Ibrahim ‘Awaad Mohamed al-Sha’ir, said that at approximately 22:00, he received a phone call from the Palestinian Liaison informing him about arresting his brother at Beit Hanoun (Erez) Crossing. Ramallah and al-Bireh: Israeli forces established (7) checkpoints all over the city. On Friday, 13 July 2018, Israeli forces established 3 checkpoints at the entrance to al-Nabi Saleh village, northwest of Ramallah, at the entrance to Kherbitha al-Mosbah village, west of the city, and at the entrance to al-Moghair village, northeast of the city. At approximately 07:30 on Friday, 13 July 2018, Israeli forces established a checkpoint at the main entrance to al-Nabi Saleh village, northwest of Ramallah. At approximately 11:30, a similar checkpoint was established at the main entrance to ‘Ain Yabroud village, northeast of the city. At approximately 16:20 on Saturday, 14 July 2018, Israeli forces established a checkpoint at the entrance to Ras Karkar village, west of Ramallah. At approximately 20:30, a similar checkpoint was established at the entrance to al-Nabi Salah village, northwest of the city. On Thursday, 12 July 2018, Israeli forces established 3 checkpoints at the entrances to Ethna and Beit ‘Awaa villages, and at the entrance to al-Fawar refugee camp. On Friday, 13 July 2018, 4 similar checkpoints were established at the entrances to al-Dahiriyia, Sa’ir and al-Nabi Yunis villages, and on al-Hawawer Road. On Saturday, 14 July 2018, Israeli forces established 3 checkpoints at the entrance to Sureef village, at the entrance to al-’Aroub refugee camp, and at the western entrance to Hebron. On Sunday, 15 July 2018, Israeli forces established 2 checkpoints at the entrances to Beit Ummer and al-Shayyoukh villages. On Monday, 16 July 2018, 3 similar checkpoints were established at the entrances to Beit Ummer village, at the western entrance to Hebron and at the entrance to Beit ‘Awaa village. On Tuesday, 17 July 2018, Israeli forces established 2 checkpoints at the western entrance to Hebron and at the entrance to al-Fawar refugee camp. On Wednesday, 18 July 2018, 4 similar checkpoints were established at the entrances to Ethna and Kharsa village; on Tramah village’s road, and at the northern entrance to Halhoul village. At approximately 09:20 on Friday, 13 July 2018, Israeli forces established a checkpoint at the eastern entrance to Qalqiliyia. At approximately 13:45, a similar checkpoint was established at the entrance to ‘Izbit al-Tabeeb village, east of the city. The abovementioned checkpoint was established again at approximately 23:00. At approximately 04:30 on Saturday, 14 July 2018, Israeli forces established 3 checkpoints at the eastern entrance to Qalqiliyia (was established 2 times) and at the entrance to Heblah village’s tunnel ( at the southern entrance). On Sunday, 15 July 2018, Israeli forces established 4 checkpoints at the eastern entrance to Qalqiliyia, east of the city; at the entrance to Heblah village’s tunnel, south of the city; and at the entrances to al-Nabi Iyyas and Jeet villages, east of the city. At approximately 16:20 on Thursday, 13 July 2018, Israeli forces established a checkpoint on “Yitzhar “settlement road, south of Nablus. At approximately 20:15 on Friday, 14 July 2018, Israeli forces stationed at Beit Foreek military checkpoint, east of Nablus, obstructed the vehicles’ movement in both directions. They also stopped Palestinian civilians’ vehicles and checked the passengers’ IDs until the evening hours. At approximately 10:30 on Saturday, 14 July 2018, Israeli forces stationed at Za’tarah checkpoint, south of Nablus, tightened their arbitrary measures against Palestinian civilians and obstructed their movement. At approximately 15:20, Israeli forces established a checkpoint at the entrance to Northern ‘Asirah village, north of the city. At approximately 20:15 on Sunday, 15 July 2018, Israeli forces established a checkpoint at the entrance to Qarawet Bani Hassan village, northwest of Salfit. At approximately 10:00 on Monday, 16 July 2018, a group of Israeli settlers from “Leshim “ settlement established in the lands of Dir Balout village, west of Salfit, levelled 82 dunums, which were called as “Bab al-Marj”. The settlers demolished 100 olive trees in favor of the abovementioned settlement. The levelled land belong to Na’iem Rushdi Jabbarah and Idrees Jabbarah ‘Abdullah, from the village. “Leshim “ settlement is an example of what the Palestinian countryside is suffer from. On 28 June 2018, a wastewater treatment plant was established in the western side if the abovementioned settlement, which resulted in enormous damage to the agricultural seasons in the village such as squash, garlic and okra. Most of the village residents rely on these crops.